Pointing out that all humans have the exact same-- equal and identical-- rights isn't the same as saying all humans are exactly the same. I notice "bordertarians" and other borderists making this nonsensical mistake over and over again in a desperate attempt to justify their anti-liberty position. 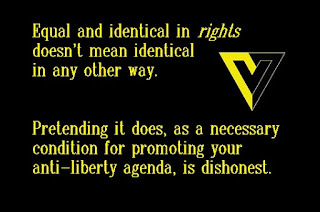 Rights don't depend on where a person was born, where they stand, or which State claims ownership over them. Rights only depend on their species and on them being alive. Some cultures are better than others because some cultures (by which I mean the individuals who make up that culture from the "bottom up") "tolerate" liberty and respect rights better than others. This doesn't alter anyone's rights. Some individuals are better than others because some individuals archate less often, and don't support archators as much as others do (they are more ethical than those who archate and support archation more often). Some people are smarter than others, and everyone is smarter about some topic than just about anyone else. Humans hold a variety of beliefs; often contradictory beliefs inside the same brain. It only matters what people do, not why they do it, or what beliefs led them to act. Some beliefs are better than others, and some are outright reprehensible-- those which convince a person it is right to archate being among the nastiest beliefs. Yes, some people believe it is OK to govern others; these people are holding a barbaric primitive belief. Everyone else has the right to defend themselves from the people with this belief if they try to act on it. No one has the right to govern because this is a right which can't exist. If it did it would contradict itself. Humans come in a variety of sizes, shades, and shapes. This is irrelevant to their rights. Humans are equal in the rights they have, and in nothing else. This truth doesn't justify devotion to a theft-funded, anti-property rights, Big Government welfare/warfare program at "the Border". Nor does the intentional and dishonest conflation of political "borders" and private property rights. It's amazing to me how they can turn this around inside their own minds and call a rejection of their favorite type of communism "leftist". How can you twist your mind that much? I have no idea. 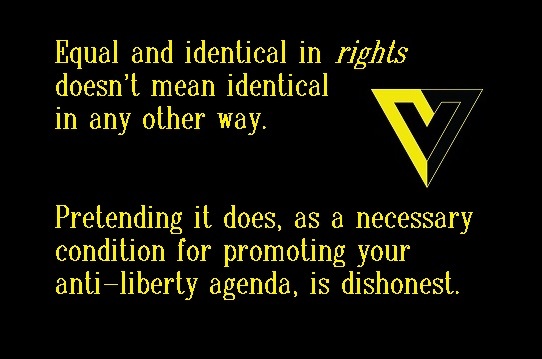 If someone who is otherwise libertarian believes something to the contrary, they are mistaken and internally inconsistent on this topic-- perhaps only on this one topic. They might be a fine person otherwise, but on this, they are wrong. And I would be dishonest if I failed to point this out.